They may not be the prettiest fruit to look at, but avocados are positively packed with nutrition. Avocados are a great source of monounsaturated fatty acids, potassium (they actually have the potassium content of two to three bananas! ), vitamins E and B, as well as fiber. A 3 1/2-ounce serving of an avocado contains 160 calories, and 485 milligrams of potassium. Avocados are second only to olives for their content of unsaturated oil. They contain oleic acid and linoleic acid, which can help lower cholesterol levels. Avocados can be enjoyed any time of the day. For breakfast, a favorite is to mash avocados on top of whole-wheat toast. 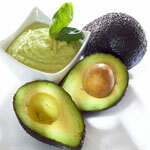 Use mashed avocado instead of mayonnaise on sandwiches, or enjoy guacamole for lunch or dinner. Try combining sliced avocado, fennel, oranges, and fresh mint for a tasty salad. Ripe avocados should yield slightly to gentle pressure. Avoid overripe, rancid avocados with brown meat. These will be mushy to the touch. A firm avocado will ripen in a paper bag or in a fruit basket at room temperature within a few days. As the fruit ripens, the skin will turn darker.